No doubt, Tech students can still fondly remember those early science experiments that sparked their love for the subject and other STEM fields. It is that precise fondness for STEM that the recently chartered Little Einsteins Organization (LEO) aspires to bring to other young students in Atlanta. The Technique chatted with four leaders of the new club to learn more about their initiative. The idea for LEO stemmed from the Discovery program, an initiative started by the service organization Hands On Atlanta which aims to enrich the experience of education in Title I schools in Atlanta. Diana Toro, a third-year BCHM major, and Tessa Stubbs, a third-year CS major, started volunteering for Discovery at nearby Scott Elementary School when they noticed the lack of STEM resources available there. Wanting to enrich the STEM opportunities at the school, Toro and Stubbs began by encouraging their friends to volunteer with them at Scott Elementary School until they formed a partnership with Discovery to run their own STEM program. Becoming their own program enabled them to organize and conduct their own science experiments for the students. It also allowed them to become a chartered club at Tech this past year. What had started as a volunteering project for a handful of friends has now grown into an active organization with over 40 members and over 1,000 followers on their Instagram, @gatech_leo. Toro explains the rapid success of LEO in terms of its purpose in filling a missing need in the community and school systems. The leaders of LEO further attribute the popularity of the club as resulting from the bonds that the members are able to build with the young students. They described the trust and affection of the kids, such as the way in which the kids attach themselves to the older Tech students. They also laughed over the mischievousness and cleverness of the kids, describing the fun-loving and energetic environment of the school. Toro recalled a game of Simon Says she had recently played with the children that particularly highlighted the ingenuity of the young students. In addition to managing the children, the leaders discussed the other challenges that LEO faces. They explained the difficulties that come with designing experiments that are both feasible and fun for the children. Joy Nish, a second-year BCHM, and Greg Varghese, a third-year CS, also explained how important it was to be flexible and adaptable in LEO, since the local schools often lack the resources and equipment necessary for students to perform experiments. As LEO must provide its own experiments and materials, all leaders agreed that funding is the biggest challenge for the club moving forward. Despite the challenges this new club faces, its leaders are optimistic about its future. They hope to expand LEO so that it reaches multiple schools in the Atlanta area, and they envision the possibilities that could form. When pursuing something so intensely, it is often easy to forget how much joy that subject once brought you. As the semester picks up and Tech students become more and more overloaded with assignments and exams, childlike enthusiasm and wonder for learning and science seems to diminish more and more. 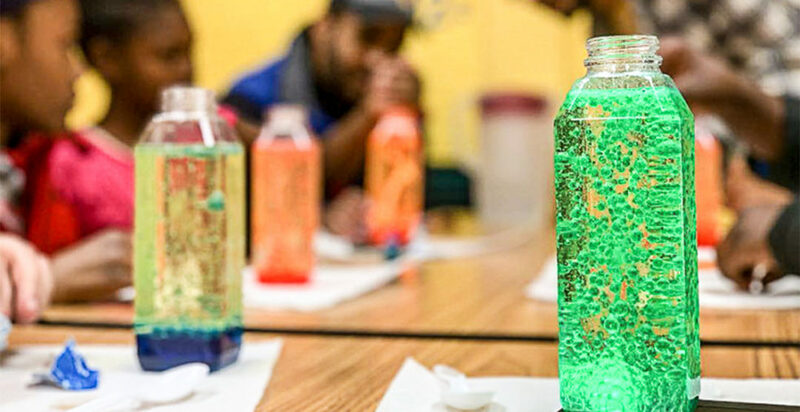 It is easy to forget the excitement and stimulation that once came with the science experiments of the past, but revisiting these old experiments and showing them to younger students has the power to serve as a reminder for the joy and benefits of learning.